Parking Lot striping and traffic marking is a key component to a paving or sealcoating project. Gator Construction can lay out and stripe a newparking lot or an existing one. All parking lot striping will be reconfigured to meet all the necessary requirements for all local codes and ADA (Americans with Disabilities Act) handicap requirements. All traffic paint meets all DOT requirements. Note: Proper line marking and striping is important to your parking lot for safety and improves your traffic flow. 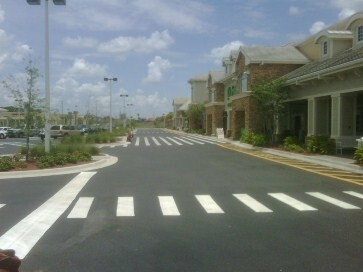 This entry was posted in ADA Construction, Fort Myers Parking Lot Maintenance, Our Services, Striping & Marking. Bookmark the permalink.